Are your AA rechargeable batteries dying after only a few minutes of use? The WizardOne MH-C9000 Battery Charger and Analyzer can give them little bit more life through analysis and conditioning. In addition to showing your batteries' max charge, the WizardOne can break them. 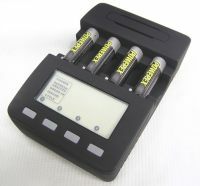 You input the maximum charge, and the gadget performs a "forming" charge, juicing them up to the optimum capacity. There's also a cycle mode that charges and discharges batteries automatically for up to 15 cycles, useful for resetting a battery that lost a great deal of its charge. The WizardOne ships in December for $69, and is pretty useful if you go through a lot of AAs in various electronics around the house.